The Firestorm 30 Fire boat, "BMCM Carl Brashear" is ready to go into service for the Newport News Fire Department in Virginia. MetalCraft Marine is pleased to announce that the Firestorm 30 Fire boat, "BMCM Carl Brashear" is ready to go into service for the Newport News Fire Department in Virginia. The boat had partially sunk on March 21, with a flooded engine room. The engines, generator, and other components that may have been damaged by the flooding have all been replaced. Insurance investigators attributed the partial sinking to a combination of circumstances that set up the flooding conditions. Although equipped with automatic bilge pumping, the circuits powering these pumps had been inadvertently turned off. This, combined with unusual weather and sea conditions, were reported to have caused sufficient water ingress to bring down the stern and flood the engine room. The investigator's report found no fault with the vessel design or the workmanship by MetalCraft Marine, and authorized the vessel to be returned to MetalCraft in order to replace the engines and other potentially compromised components. The vessel has now been fully re-equipped with new engines, generator, and other electronic components. Newport News Fire Department officials came to Kingston to participate in the sea trials of the vessel and were pleased with the performance of the vessel, its fire fighting systems, and emergency response capabilities. Insurance surveyors have also gone over the vessel thoroughly, and find all systems to be fully functional for all design service conditions. The boat is expected to be back in Newport News later in August. MetalCraft staff will be returning to Newport News to provide further crew training to the fire department on the BMCM Carl Brashear. When the vessel arrives in Newport News, a Norfolk, Virginia based marine surveyor will conduct another survey to ensure that no damage occurred during shipping. MetalCraft Marine is confident the boat will be an extremely useful new apparatus for firefighting and emergency services in and around the Newport News community. 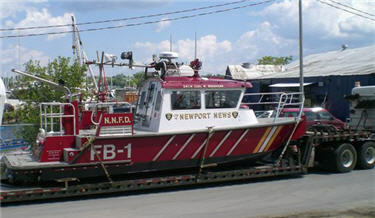 For further information about MetalCraft Fireboats, or specifically about the BMCM Carl Brashear, please feel free to visit our web site at www.metalcraftmarine.com or call Henry Copestake at 1-800-410-8464.